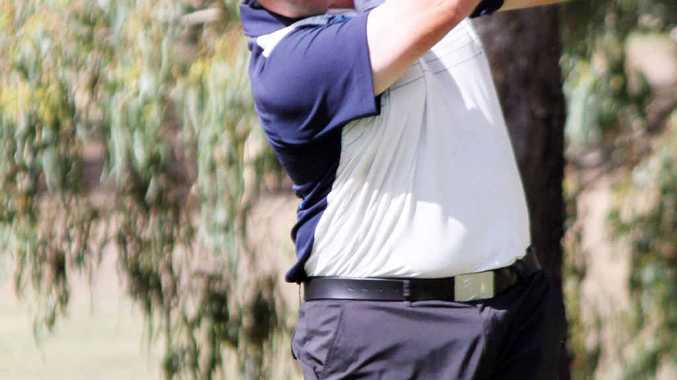 THE unpredictable nature of the Mining Town Series continued at the Emerald Pro-Am at the weekend, with Queensland's Christopher Wood emerging victorious at the end of another rollercoaster tournament. Wood was the fourth different winner from the four pro-ams in the series to date and, for the third tournament in a row, the overnight leader was unable to go on to victory. "It's pretty much anyone's game at the moment," Wood said. "It just goes to show the depth in the field. "This is the strongest field we've had. "It's definitely a lot more exciting. "It just makes you want to win and try that little bit harder." Wood trailed Adam Blyth by three strokes after the first day, but shot an amazing seven under par second round - including birdies on his first four holes and on three of his last five - to secure a comfortable three-shot win. "I've been playing pretty steadily," he said. "I just tried to stay patient." Tournament co-ordinator Clay Jacobson said Wood was earning himself a reputation as a strong finisher. "He's a bit of a second-round expert," Jacobson said. "It's the second round where he really seems to fire-up. "He had by far and away the best score in the second round." But Wood was quick to play down this suggestion, saying he just tried to do his best each time he hit the course and was happy any time he played well. "I don't see myself as a strong finisher," he said. Jacobson said the evenness of the field in the Mining Town Series made for entertaining golf. "It's certainly evenly contested at the moment," he said. "It is well spread out. "They've all had one or two good days. "It certainly holds a lot of interest." He said it gave every player confidence knowing they were always a chance. "They can certainly get up to win," he said. "It is critical that they continue to keep up the good work." Jacobson was highly satisfied with how the Emerald Pro-Am had run. "The scoring was pretty hot," he said. "It was a sensational weekend."